Valentine's Day is just right right around the corner. Whether single, married or in a relationship (albeit complicated one)... I seriously think that a pampering session is in order. After all St. Valentine meant to share love and care. What better way than to pair up with a companion for an hour or two of blissful manicure and pedicure. This doesn't necessarily mean a boyfriend or a husband. It could your bestfriend, mom or daughter. Really, invite anyone who makes you feel special or rather someone who needs to feel they are special, too. 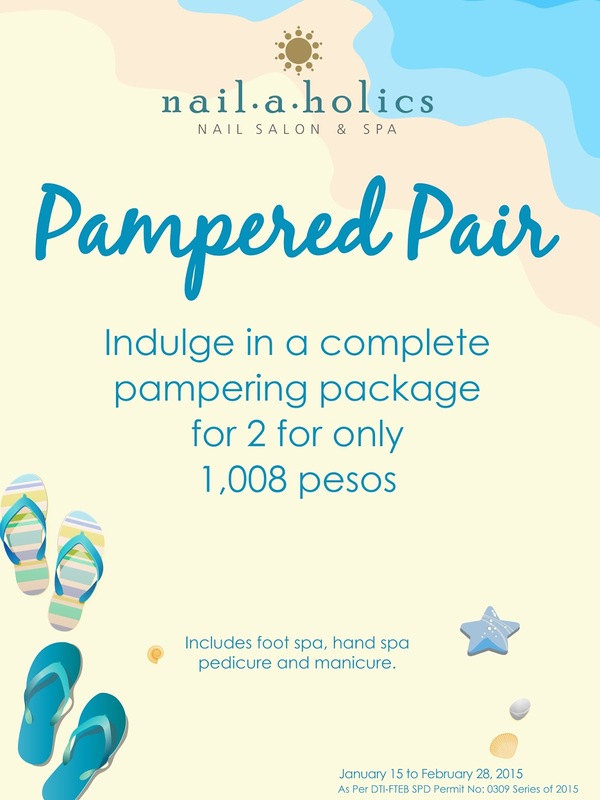 Nail-a-holics share that same sentiments with their latest promo, Pampered Pair package,that includes foot spa, hand spa, manicure and pedicure for two for only Php1,008! This offer is valid at all 50 Nail-a-holics nationwide until February 28, 2014. Can't wait to share a some pampering time with the husband on the 14th at Nail-a-holics. And it'll surely be a relaxing since we love the beach-inspired interiors of the place that reminds us of our favorite vacation spot, Boracay. We definitely need all the pampering since we barely had rest from caring for baby #CamillaClaudette for all the nine months she's been with us. :) Hehehe! So if you still don't have anything planned for the big V-day, keep Nail-a-holics Pampered Pair promo in my mind! for more information, visit Nail-a-holics Nail Salon facebook page.